You love No Name Bacon, you love popcorn — wouldn’t the world be a better place if you could have No Name Bacon popcorn?! It’s easy! Heat oven to 400 degrees. Spread your No Name Bacon on a baking sheet and top with 1/3 cup brown sugar. Bake until crisp (between 10-15 minutes, depending on the oven). Chop into No Name Bacon bits. Pour the bacon grease into a large sauce pan and heat over med-high heat. Add desired amount of popcorn kernels and cover. Keep a close eye on your popcorn — shake the pan back and forth to evenly distribute the heat and turn down the heat, if necessary, to prevent burning. 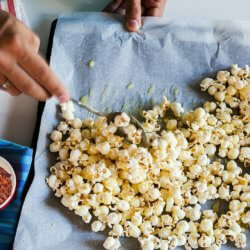 Toss popcorn with No Name Bacon bits and salt to taste. Take a bow! Because everyone will be thanking you for making this amazing, bacon-y treat!